Data Analysis using Linest and the Data Table function. In mid May, Anup47 asked a question in the Chandoo.org forums about the use of a VBA macro to run a number of iterations of a variable against two sets of X values, you can see the post here. It turns out that the number of iterations was 500 columns of data with each column having 27 values. On examination of the problem, it was going to be a straight forward matter of setting up a statistical function Linest and then using the Data Table command to run each set of data through the function. The Linest will take the input data and return the statistics that Anup wanted. The Data Table function will feed in the source data and tabulate the Input and Output data. This Post follows through a worked example which you can follow along, download the Sample file to suit Sample File 97/2003 or Sample File 2007/10 version. The Sample File contains a worked example of the completed model as well as a Practice Page of the original data. Download the Excel 95/2003 or 2007/10 version above. Please note that the sample file only contains 14 sets of data as opposed to the 500 Anup47 wanted to process. There are a few things that needed setting up before the work starts. Once these areas are setup we simply use the Excel Data Table function. Once the Data Table function has run, the results can be processed or analysed as required. The original data was just that, a tabulation of raw data. The two X sets of Data were in Columns 1 & 2. 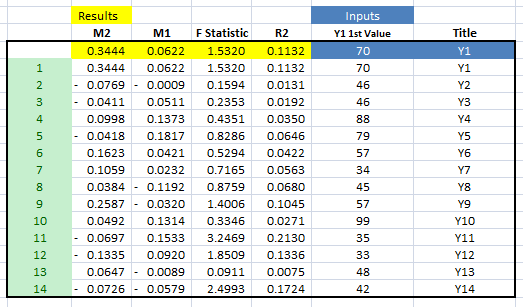 Each Column from D onwards has a set of Y data that was to be processed. The first thing that was required was some Headers for the Input Data. This isn’t strictly required but it is good practice and makes it easier to tabulate and analyse results later. Put X1, X2 in A1, B1 and Y1 in D1 and then drag the lower right Black Handle across top to the right and Excel will autofill the remaining cells. 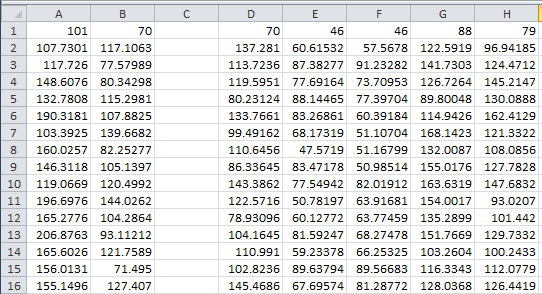 To get the statistics which Anup wanted we will use the Excel Linest function. Linest is a Statistical Function that takes a set of data and compares it, in this case to two sets of X Values and produces a set of statistical measure relevant to the correlation between the data sets. This post isn’t going to explain the intricacies of Linest and I refer you to the Links section at the end where you can read more about the Linest function at your leisure. For our purposes we need to know that Linest is an Array Formula and requires a 5 Row x 5 Column area to be entered into. For now we will just Array Enter the function =Linest($D$2:$D$28,A2:B28,True, True) into B32:F36. To do that select the range B32:F36, Press F2 and type/paste the equation in, then Array Enter with Ctrl Shift Enter. 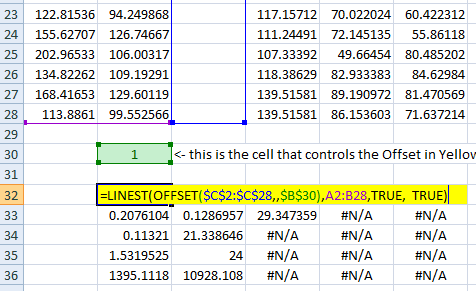 To Link the Linest equation to a Data Table we need a link cell, which we will put just above the Linest area. For now just enter a 1 in it. What this does is allow the Linest formula to access different columns Y1 to Y500 depending on the value of the Link cell B30 which is now 1. To setup a Data Table area we need a column of Inputs which will be the Run Numbers and the Row Inputs will be links to the Input and Output Cells. In a range J33:J46 put the values 1 to 14. These will be the Run Numbers. ie Run No 1, Run No 2 etc (Green in the example below). In this case there are 4 Output links =B31, =C31, =B34 and =B33 and their associated labels above them, as well as 2 Input equations and there Labels. 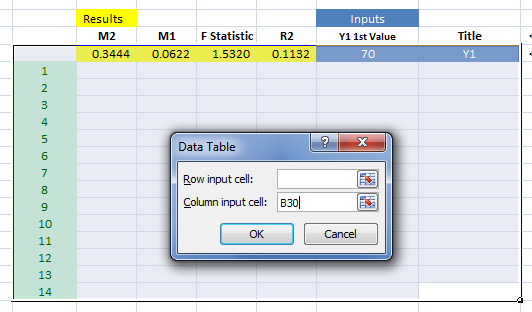 The Input equations are simple Offset function that retrieves a value from Rows 1 or 2 based on the value of the Link Cell B30. These are technically not required but make data analysis and identification of individual results later on a lot simpler. Noting that we will be using a Column Input cell and that it will link to $B$30, the Link cell for the Linest command. What this does is takes the first value from the Column J32:J46 and puts it into B30, then the Linest command will be calculated and the results put into the Data Table area along with the Inputs. This is repeated for each cell in J32:J46 automatically. You can see by extending the Data Table input column from 14 to 500 that the full 500 columns of Input Data could easily be processed. You now have a set-off data that can be analyzed using normal statistics, Min, Max, Std Deviation etc, or can be fed into a Pivot Table/Chart for analysis etc. How can the Data Table command help you become a data processing super hero? Great - Learned Something New Today. I have a historical data of particular company like 5 yrs daily closing price. 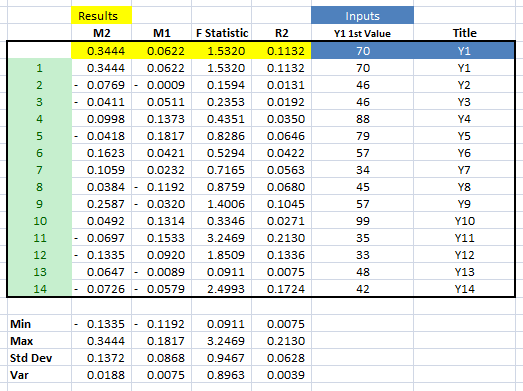 I have data for two analyst performing same taks in two diff columns. How do i get to know who is the better analyst. I want to learn to use multiple sheets (one for input) and second for modeling. When I am using data table, I got an error "Input cell is invalid" when I try to use a different sheet. i found the following on microsoft website. 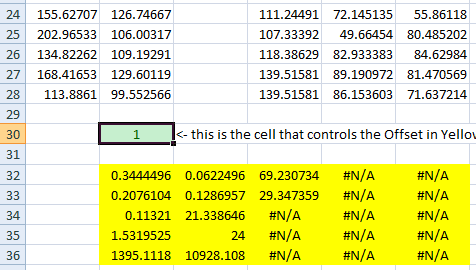 I am trying to link the cell and try again, but linking the cell is not clear to me beside =Sheet1!C3. This method does not work. Row 1, column 2 net profit entry is a reference from other sheet. 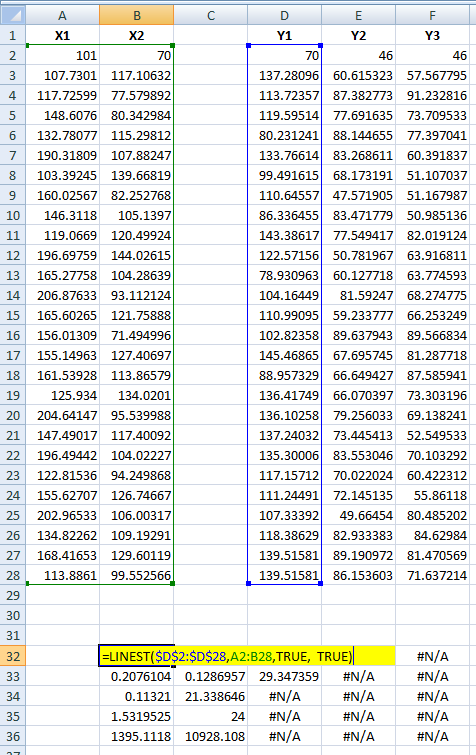 As you can see the values generated by the table is identical. I am not sure what is going wrong and how to use this workaround? In above example Row1, column 1 is empty (assumption, but alignment issue when posting). I am referring to $38.33 and 60,000 row. It's empty cell in column1, $38.33 in column2, and $60,000 (outside the table, column 3). In what-if analysis, column selection is $60,000. The example above has columns as a variable. I'm trying something a little different. I'm working with a table trying to figure out a way to use linest() only with a select number of rows. The selection is based on a product. A bit like sumif(). I have plus 100.000 rows of data and a number of products. Is there a way/formula to select/filter the datainput to Linest based on the product without using VBA? (I guess I could use VBA to filter and copy the relevant data to a new sheet but I'm trying to avoid VBA in this context).